In Cambodia, I wake up around 7 a.m. to get ready and finish breakfast by 7:30 a.m., which is when we leave to the elementary school called Treak Community Center. I order the fruit platter every day, since there are limited vegan options. The iced tea tastes syrupy despite not having any sugar added, so I just drink the hot tea. Others usually get one of the variety of pancakes or eggs and bread along with a smoothie. We can only choose one meal and one drink from a selective menu for the free breakfast, which lasts from 6 a.m. to 10 a.m. When we’re ready to leave, we all go outside to the tuk-tuks, which are motorcycles with seats attached to the back. They go about 30 miles per hour, making trips usually last longer than they would by car. 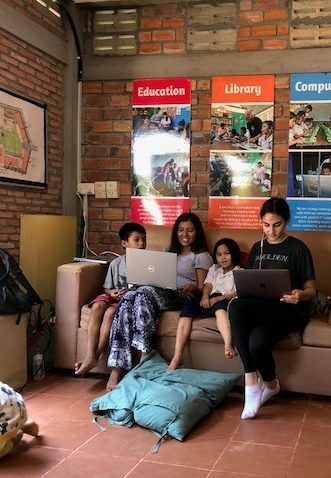 When we get to the school, a trip that usually takes around 15 minutes, we go straight to the office and begin working on our individualized projects. My project is based around organizing the school’s health education program, which will teach kids about how to take care of oral health, sickness and nutrition. The gong rings, signaling all the kids to go to the assembly, where they do some dancing, stretching, and sing songs with the teacher, both in Khmer and English. Once it’s 11 a.m., it’s time for our break, which lasts until 1 p.m. Some people venture out of the school to try local street foods, while some of us stay to eat a $2.00 meal or take a nap. US dollars are exchangeable with Cambodian money, called riel, and the people here accept both as long as the US dollars are in new condition. Four thousand riel make up 1 US dollar. In the afternoon, until 4 p.m., we are able to go into the classrooms and work as a teacher’s assistant. I work in K2, which is the second youngest class. I generally help them with English vocabulary words and play with them. Nearly every day, it rains heavily around this time — sometimes with thunder. Once school is over, we take the tuk-tuks back to our guest house, which is a clean, family-run place for us to stay with many spacious rooms. They are willing to accommodate anything we need and have cheap, convenient services. I share a room with Alexis, with whom I have become close friends. The Wifi isn’t very good when everyone gets back, so everyone generally spends the rest of the day out in the city or in the common area if they need to get work done. Every weekday usually follows the same routine, but the weekends are when we are able to explore more of Cambodia and have time to ourselves.